Reporting back on my experience this morning...My Fidelity rep walked me through the process of transferring assets in kind from HSA Bank and TD Ameritrade. Everything accomplished online. I just needed to input account numbers and attach the most recent statement from both. Online signature accepted without Medallion guarantee. Entire process took about 10 minutes. I spoke with TWO HSA reps who ASSURED me in-kind transfers could not be done. So I liquidated to cash. I had a feeling these people did not know what they were talking about. It's a little late for me - but can you please tell me the process you completed for in-kind transfers? Perhaps it'll help others here avoid doing what I did. 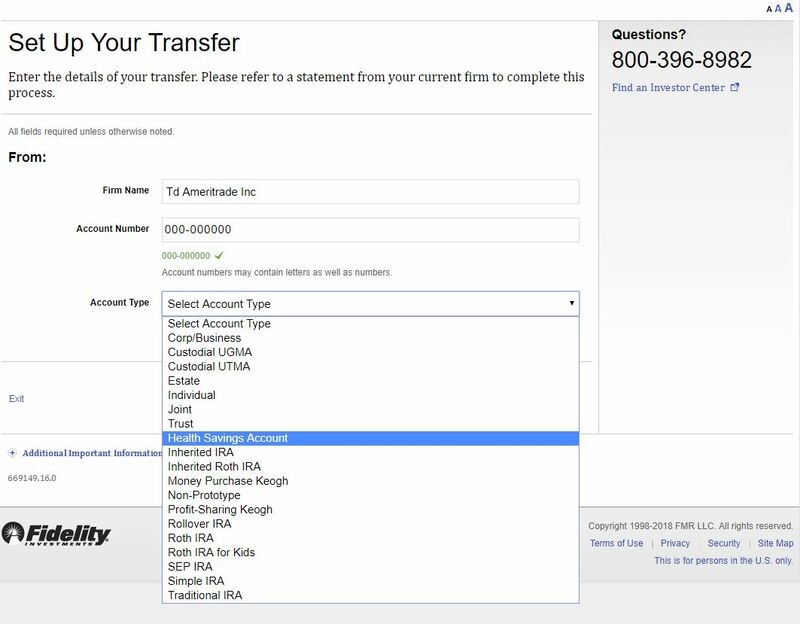 I just used the Transfer menu inside the Fidelity account. I selected Transfer from>>Another Financial Institution (Transfer Assets)>>Continue>>Start A New Transfer and then followed the process through to the end. Last edited by grp2c on Fri Nov 16, 2018 12:01 pm, edited 1 time in total. For those attempting to transfer directly from TDA to Fidelity, wouldn't TDA charge you a full transfer out fee of $75 (unless you are Apex)? If TDA charges me, I'll bring it up with Lively. They very explicitly promised no fees. Lively could claim that those are third party fees which they have no control (e.g. you need to pay commissions at TDA to trade stocks). aristotelian posted Lively's reply earlier, which says they don't charge fees "on their end". I think if you convert to cash, and bring it back to Choice Financials (CF), TDA will have no reason to charge you. You can then transfer out all the cash from CF to Fidelity for no fee since your account is more than 12 months old. I also have HSA Bank and TD Ameritrade. Were there any account closure fees at either one? Did you take any actions on the HSA Bank/TD Ameritrade side of things? Or just do everything through Fidelity? Click on 'More transfer options' located at the bottom right hand corner of the pop up. Just posting this to clarify a previous post that mentioned APEX level at TDA. The tiered system vanished after they merged with Scott-Trade earlier this year, so I may be hit with an account closure fee. HSA not listed under "See compatible account examples". How about an account closure fee at TD Ameritrade? Is it easy to transfer both accounts? Or would it be better to liquidate the TD Ameritrade account and just transfer from HSA Bank to Fidelity? You can electronically transfer cash up to the annual contribution limit. So if you transfer ftom HealthEquity to Fidelity at least annually, you will just be able to withdraw from HI and then electronically deposit with Fidelity without filling out any forms at all. Fidelity will then report it as a contribution, and HI as a withdrawal. You will file both tax forms away in case there is ever a question raised as to why you contributed Maximum amounts to both Fidelity and HealthEquity in one year, or why you withdrew funds with no medical expenses to justify them. I've done similar types of transfers before with no complications. There is no dollar limit for rollovers. Rollover contributions and normal contributions are reported in different boxes in Form 5498-SA to the IRS. If you'd like to have the rollover contributions reported correctly to the IRS you should tell the HSA provider you are making a rollover contribution not a normal contribution. If I do a direct transfer from HSA Bank to Fidelity, is this something I have to remember to report on my tax return? Nothing for a direct transfer. Cap gain in 2016 for FUAMX was 0.075/10.67share price, = 0.703% capital gain for that year (2016), that doesn't seem so bad. Sure, 0 would be better, but that expense ratio's about as low as they come, about 1/5th the ishares ones I was looking at. Yes, in terms of costs, the capital gains for these types of funds are fairly minimal, especially compared to the ERs of similar ETFs. The only reason I stopped using the Fidelity Treasury funds (except for Money Market) is to minimize the paperwork at tax time. Since HSAs are not federally taxable, the brokerage firm does not send out the typical 1099B forms. Instead, one has to look at their year end statements to calculate the distributions for each fund just for the sake of filing CA state taxes. It's neither hard nor complicated but moving to individual Treasury bills/notes saves me that little bit of effort. For people in California, would FUAMX (Fidelity Intermediate Treasury Bond Index Fund) be state tax free? See my comments above and take a look at Fidelity's auto-roll program for Treasuries and CDs. For now, until you figure how you want to invest your HSA, keep all of your assets in FDLXX, Fidelity Treasury Only Money Market. Dividends are tax-free for CA and since its a money market fund, the NAV will stay at $1, so no capital gains. The iShares Treasury ETFs aren't the only ones. Is that along the general guidelines of what others would be doing? For US bonds, the suggested recommendation is FXNAX (ER 0.025%) unless you are specifically choosing to have Short-Term Treasury bonds in your AA. Does your state recognize HSAs? If not (e.g. CA), then the suggested recommendation is to hold Treasury bills/notes/funds since these are generally state-tax free. I'm curious also about the user interface for Fidelity. One thing I liked about Lively is I could snap a picture of my medical receipts and have them stored with Lively ready to be reimbursed at any time. It doesn't look like Fidelity will have that sort of functionality (or I'm missing it). What do others do for storing receipts? I would probably use EverNote or Google Drive to replace that portion of the functionality. This is very good to know. Thank you. Although, I wish the expense ratio was lower! Last edited by fareastwarriors on Fri Nov 16, 2018 1:53 pm, edited 1 time in total. I opened my Fidelity account, but the site is a little cumbersome to find answers to things. 1. How do I request an HSA debit card? I also need one for my wife. 2. Is there a way to automatically invest funds when you make deposits? 3. Will Fidelity automatically sell funds to cover costs or is there a cash balance that must be maintained? This kind if functionality is ultimately useless. It just makes you feel more stuck with that HSA. And if the IRA audits it's all on you anyway. True, it's just a matter of workflow I guess and I do agree that having that outside the HSA platform itself may be a benefit. So, it's certainly not a deal breaker, but was curious how others handled the digital storage of HSA receipts as it doesn't look like Fidelity will be doing anything in that arena. Fidelity offers FidSafe, a digital archive solution that is intended to be long-term storage of important documents. It supports documents up to 200MB each and total of 5GB of storage. My employer sponsored Fidelity HSA has a service called Track and Pay. You can keep track of claims and upload receipts. However, I don't use this feature since its linked to my employer and I don't know if get to keep it if I ever switch jobs. Instead, I just keep PDFs or pictures of bills in Google Drive sorted by year and by family member (e.g. 2017-DW, 2017-DS). The Fidelity HSA shows a link to something called Track and Pay. I haven't tried to go through the set up, but it sounds like it does what you want and syncs to your health insurance plans. I submitted my transfer form along with statements as a message to Fidelity yesterday, and today they responded that it was being processed. The form does not have to be mailed. Just to clarify, you attached the form and the statement from your old provider to a secure message (under Customer Service > Contact Us > Email a secure message)? Okay, I just tried the same thing. Hopefully it works, as it saves me a stamp and a walk to the mailbox... Will update when I know more. "Please note: We are unable to act on any money movement requests or trading requests to buy, sell, or exchange securities via email." Hopefully this doesn't count as a "money movement request." 1. Could be more advantageous to charge a medical bill onto one of your own credit cards which earns rewards, and then later pay that charge with funds from the HSA distribution. Document it on Form 8889. That sound like they will NOT process transfers requested by secure message. It would be good to hear back from people who've tried this (though it may take a while to know one way or another). The transfer menu and resulting process allows uploading a statement and any supporting documents and generates a transfer form that they have you sign online. I'm not sure why the secure message route would be needed. It didn’t allow it for me yesterday when selecting HSA Bank. I agree, but someone else in this thread got confirmation that the process is underway after submitting in online. It possible that "money movement" refers to transfer amongst Fidelity accounts, etc. as opposed to something like a trustee-to-trustee asset transfer. I just received a secure message from my Fidelity rep: He said that the assets from TD Ameritrade will come over online, but HSA Bank requires a hand signature for their TOA form. Fidelity is overnighting that document to me, and providing an overnight mailer for me to use for return. I don't think there is any special documentation on that form? It's a qualified withdrawal either way and the HSA administrator includes it on form 1099-SA. We pay all medical bills with a credit card for the rebates and bonuses and then have the funds transferred from HSA to checking account. Fidelity offer a 2% credit card, themselves, so taking the HSA debit card would be like volunteering to pay a 2% transaction fee on all medical expenses. I have no interest is automatic selling or a debit card, myself, but they do offer a debit card for the HSA, don't know about automatic selling. The cash account on the HSA is a low interest FDIC bank account (0.31% for balance of $5K or less), though that's better than most other HSA cash accounts. I don't plan to keep anything in the cash account. I entered it all online - very clear instructions from Fidelity. The TD Ameritrade transfer went through. For HSA Bank, Fidelity provided the completed form as a PDF, told me to print, sign, and mail back to them along with a copy of my account statement. Question: does transferring all monies close the account at HSA Bank? Or do I need to contact them separately to make sure the account is closed? Hayden, I don't know for sure whether or not you'd need to contact HSA Bank, but I plan on doing so. I can picture them charging their monthly fee for having less than $5000 with them until the total gets to the point where they report me as delinquent. I will budget about an hour for the call: 50 minutes on hold, and 10 minutes for the rep to check with his/her supervisor to see how to close an account! Did you do an in-kind transfer of all your stocks/ETFs? Did TD Ameritrade charge a transfer fee or an account closing fee? Different custodian, but I also got that pdf form when using the fidelity transfer process. But, I also contacted my current custodian about transferring out and they emailed me a form. In the transfer section of that form, there are check boxes to indicate: "This transfer will / will not close my HSA account". So that may be another option for you too. I'm not closing my old account, but think I am just going to do it that way, using the current custodian's form, for a number of reasons. I can fax the completed form to my current custodian and they will mail me a check, made out to Fidelity, and I can mail that to them or (I assume) take it to a branch. Does anyone have a link to the form I need to use for an Indirect Rollover? I don't want to pay the closing fee for a direct transfer. My plan is to liquidate my UMB HSA and have them transfer all funds to my checking account, then drop off a check, and the form I need at my Fidelity branch. Does anyone know if there would be a charge to have Fidelity pull (transfer) money from my Optum HSA account? I have a Optum HSA account that I need to keep open - since my employer uses it to deposit money from my paycheck. I know Optum would charge me $25 if they initiated the transfer. But I am not sure if I would still get charged by Optum if Fidelity initiated the transfer. If there is no charge from from Fidelity initiated transfers - I may just regularly pull money from my Optum account to this account. Do you login via optumbank.com or something like mycdh.optum.com? Curious because we have the latter (it's an old US Bank HSA that got converted to Optum) and I haven't been able to find good info. They're both technically managed by Optum but there are major differences in the investment platform, and I'm unsure about fee differences. I used to have a Wells Fargo hsa because it had one of the lowest fees before it was bought by Optum. The web of complicated legal structures and fund options from the two has me clueless as to how much fees are now and what they would be to transfer to fidelity. Either way I’m transferring since fees will be next to nothing, and it will consolidate accounts and logins. I'm going to try to initiate a transfer with Fidelity. The worst case scenario is that I get charged a $20 transfer outbound fee by Optum. I think it's worth a try. Unfortunately, I'll have to mail in this form or drive to a Fidelity office. Looks like the electronic option to simply attach a statement is not available for transferring funds from Optum. If no fee is charged - I''ll just plan to drive to the Fidelity office once every quarter to submit this transfer document. I'll also transfer all my assets from HSA Bank / TD Ameritrade as well. But, I am probably going to wait to find out if there were any unexpected closing fees from others before doing this. 1) Move all your HSA Bank cash from HSA Bank to the TD Ameritrade brokerage window. 4) Since you have nothing left in your HSA Bank Account - you can call HSA Bank to close your account as soon as #3 completes. In the previous thread mentioned - there was at least one post that experienced a 1 month delay while transfering from HSA Bank instead of TD Ameritrade. So -I think I'll attempt the above steps instead. The only question would be fees from TD Ameritrade for transferring all the assets out. Don't most HSA/TD combo accounts require a small residual amount to be left in the HSA bank account? I know our's requires $100 to be left in the HSA account. The online system will not allow me to transfer that last $100 into my TD account. HSA Bank allowed me to request a transfer of my entire cash balance to TD Ameritrade. I'll know Monday if it went through without any issues. This was my exact experience when I switched from HSA Bank to Lively a month ago. With $0 balance in HSA Bank side, it was quick, painless, and free to have them close the account once I saw the TDA side had been moved over to Lively and shuttered. Does anyone know if Fidelity support Institutional class Vanguard funds? That's what I have in my HealthEquity account and wondering if I'd need to sell before transferring. I don't know, but I doubt it. Fidelity's own peasant class index funds have extremely low ERs, sometimes lower than Vanguard institutional shares. So maybe it's not a big concern. if I have to sell pre-transfer, then I'm out of the market for a couple weeks, which isn't ideal.